But will it ship within the United States? Acer hasn’t said. Microsoft has long said that its Continuum feature for Windows 10 Mobile would enable PC-like performance when your phone’s connected to an external monitor. Now, Acer is seizing upon that concept with the Jade Primo, its first “PC phone” – and one that blows most of the existing Microsoft Lumia phones away. This is the flagship phone that Windows Phone customers have been pleading for, with a 5.5-inch super AMOLED display on the front, and what appears to be a return to form in camera quality: 21 megapixels, with dual flashlights on the back. On the front, there’s an 8MP camera as well. Inside will be a Qualcomm Snapdragon 808 chip, one of the first of the new generation to appear in a phone. 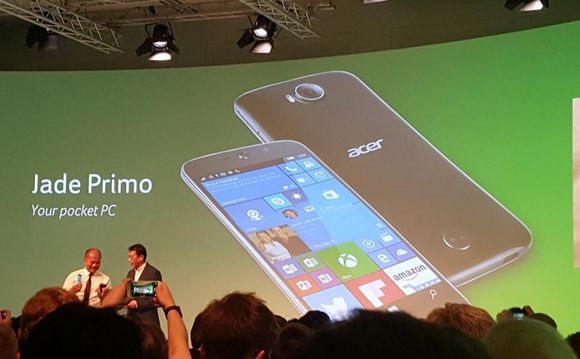 “This is absolutely, dare I say it, the first PC phone,” said Jason Chen, the chief executive of Acer. Acer executives said that they’ll ship a small docking station with the Jade Primo phone, allowing it to connect to an HDMI monitor, apparently for those who don’t have a cord. Executives showed off the phone running the Mail app on Windows 10, connected via a wired connection to the Windows 10 computer. Why this matters : The promise of Continuum on Windows 10 Mobile is lies in using your phone as your PC. By connecting it to a monior, you’ll be able to run standard Windows apps from your phone, expanded to the appropriate size on the display. Suddenly, those who have invested in a Windows phone have a way to sell it: as a miniature PC.